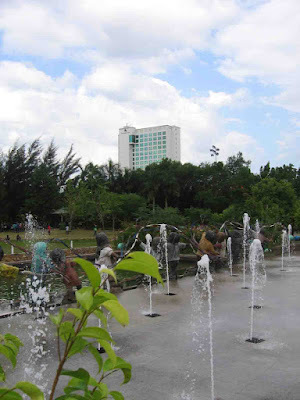 An afternoon shot of Marco Polo Davao Hotel from People's Park. See more Watery Wednesday entries here. What a joy it must be running around and through this watery play, if young. A photography which speaks volumes, much more than fits here into a comment. Wishing you all a wonderful Wednesday. Wonderful fountains. I'm sure this is a popular place for kids. Vernz, I love the fountains, too! I always love your photos, great composition in all of them. that's a wonderful place to cool off on a hot day! The fountain looks so inviting! Especially in this heat! STOP! IN THE NAME OF LOVE... is my Wednesday entry!! do come by if you can, I'd love to have your company today. Now that's a beautiful looking park! Lovely scene! Davao surely pretty. Happy WW! pagka nice sa place.....would love to visit davao someday! Nice capture! Davao is surely a good place to be.